The Bloomberg New Energy Finance Pioneers program identifies companies from across the world that are making significant gains in the field of clean technology and innovation. A panel of industry experts chose ten honorees by assessing them against three criteria: potential scale, innovation and momentum. Included in this year’s winners – innovators in bioenergy, energy smart technologies, water and solar – is Winafrique Technologies Limited, an Inveneo Certified ICT Partner (ICIP). Winafrique Technologies Limited is the first company in East Africa to successfully integrate renewable energy into the telecommunication sector, government projects and private firms. They have installed and are contracted to maintain over 150 wind/solar/diesel hybrid power systems in off-grid base station sites all over Kenya. 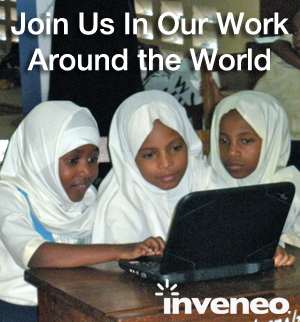 Winafrique is also deploying solar projects for schools, knowledge centers and health centers, many with Inveneo. “This award recognizes our work and effort in clean energy space, not only in Kenya but across the globe as innovative and sustainable,” said Mr. Anthony Ng’eno, Winafrique Managing Director,. “I am proud of the world class, game changing work done by Winafrique!!”. Congratulations to Winafrique! We look forward to working with them as they expand into Angola, Rwanda, Tanzania and Uganda.